A Campbell Scientific datalogging system monitoring the site of a new offshore wind farm in harsh conditions has provided better than 99 percent data recovery. npower renewables (formerly National Wind Power), the UK's leading wind energy developer and operator, has monitored numerous prospective and operational wind farm site locations across the UK, Europe, Africa and the USA. npower renewables has used Campbell Scientific equipment at the majority of these sites, having started with 21X Microloggers and CSM1 Card Storage Modules for recording wind speed and direction at prospective wind farm sites. npower renewables has moved the development of equipment to CR10s, CR10Xs and CR500s and currently prefers CR10X-1M loggers for most situations. Currently operating 15 wind farms across the UK, npower renewables has developed the leading position in the UK wind power market. Of these 15 wind farms, seven are located in Wales. These seven wind projects represent a total investment of approximately £160 million. 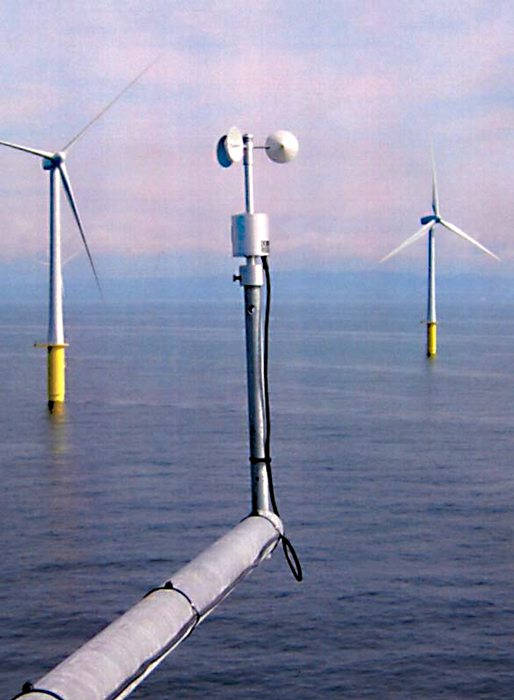 npower renewables offshore monitoring program, allied to the development of the North Hoyle Offshore Wind Farm between Prestatyn and Rhyl in North Wales, is a good example of the monitoring system requirements for wind power companies. This location has provided particularly demanding conditions for the equipment. The levels of waterproofing and protection have had to be at their best in order to maintain operational capabilities. Communication has been achieved using a Siemens M1 system (now superseded by the 20T). Seven anemometers, three wind vanes, two temperature sensors, and a pressure transducer all feed signals into the one datalogger. Data are downloaded on a regular basis and as a backup, a CSM1 with a 4 MB card stores the data on site. In the two years of operation, there have been only minor problems with the power supply (seven 85 Ah rechargeable batteries and some very large solar panels as the system has to power a foghorn as well!). Data recovery has been greater than 99 percent, and the mast continues to operate well. npower renewables' North Hoyle Offshore Wind Farm in North Wales is situated 7 to 8 km out to sea, between Rhyl and Prestatyn. The substantial project was approved by the Department of Trade and Industry (DTI) in 2002. Seeking a target of 20 percent renewable energy by 2020, as proposed by The Performance and Innovation Unit's Energy Review in 2002, North Hoyle serves as a model site. It was one of the first generation projects to prove the technology and commercial viability of wind as an important renewable energy source, bringing with it jobs and local investment. npower Juice, in a unique partnership between npower and Greenpeace, is a pioneering clean electricity product sourced from North Hoyle. Some 38,000 npower Juice customers now purchase their clean electricity from North Hoyle. By switching to npower Juice, these consumers are demonstrating their support for the North Hoyle Offshore Wind Farm and for the UK government's targets for the development of renewable energy in the UK. This unique initiative galvanized public support for renewables, offshore wind energy in particular, in a way unlike any other green product on the market. While the application for North Hoyle was being considered, the renewable energy for npower Juice was being supplied by on-shore wind farms and an established hydroelectric station in the Snowdonia mountains in Wales. npower Juice customers now represent a significant proportion of the UK's domestic green energy market. Matthew Spencer, head of Greenpeace's climate campaign, said the enthusiasm for wind power is unprecedented. "North Hoyle could be the first of many power stations at sea, which could supply the majority of the UK's electricity in the near future." Matthew Thomas, npower Juice project leader added, "Juice is an easy way for individuals to help fight global warming and lobby the government—and all by making a simple, cost-effective switch of electricity supplier."